The nuclear renaissance is a topic which continues to fascinate and one of the key figures in bigging it up is Mark Lynas, who is now better known for his pro-GMO conversion speech which received a lot of publicity earlier this year. 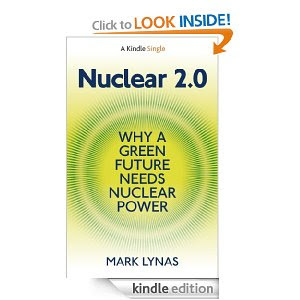 Mark has just produced an ebook called Nuclear 2.0 which is a distillation of his current thinking and seems to have come about as a result of his involvement with the film Pandora's Promise, the making of which involved filming in such well known holiday locations at Chernobyl and Fukushima. He knows his stuff — it's not an armchair treatise — and he marshalls his facts to present a cogent argument that we should be investing heavily in nuclear power and not just relying on renewables, energy efficiency and carbon capture and storage to build a low carbon energy network fit for purpose. I won't argue with this - in fact, I find myself in total agreement. My only quibble is to wonder about who this ebook is written for? The vast majority of people I know are either totally disinterested in the whole energy debate, or are already in favour of nuclear power - certainly, they are not afraid of it. But then I don't know many Germans and they seem to have a more universal distaste for all thing nuclear (except of course down at their local radiotherapy treatment centres where cancer victims seem quite relaxed about being bombarded with radiation). In this country, there remains a solid core of energy activists who have dug their heels in and continue to think that nuclear power is the work of the devil, and that the not-insignificant issues with its roll out (cost, proliferation, decommissioning, waste, terrorism, risk of accidents, to name but seven) are simply insuperable. The news is that they're not. Actually, this solid core is not that small. There is Greenpeace and Friends of the Earth (although, as Mark points out, neither of these campaigns very strongly against nuclear power these days), there are a handful of leftish/greenish MPs and there are shadowy bodies like the Nuclear Consulting Group which is not really a consulting group at all but a bunch of anti-nuclear academics. Together this consists of a considerable anti-nuclear lobby with some well known names. My guess is that Nuclear 2.0 is written with them in mind, but I also think it's more than likely that none of them will be bothered to read it and, even if they do, they won't be convinced by its arguments. Which is a shame. Nuclear power may well be expensive to build and difficult to maintain, but it still wins out as one of the less destructive ways of making electricity. The risks are overstated. Well, I attended one of the showings of Pandora's Promise (at the MIT Nuclear Science department). Of course that showing was filled with people who are on board. But there was one guy from the general public who asked questions at the end, who said he wasn't convinced by the movie itself and wanted to see the sources. Robert Stone said then that a companion book was coming out with the data and sources, and that seemed to be what the guy was asking for. So you aren't the target, I'd guess. That guy is. Maybe. But Nuclear 2.0 is a fairly short treatise. If you want a more detailed airing of the various arguments, I'd recommend Gwyneth Cravens "Power To save The World." 'it still wins out as one of the less destructive ways of making electricity' LOL, can't think of a more destructive method myself! Warning, if you use language like 'solid core of energy activists who have dug their heels in and continue to think that nuclear power is the work of the devil' people might think your argument is shaky if you 'argue' in that insulting manner. Of course, they couldn't possibly have perfectly valid, scientific reasons to hold a view opposed to yours could they. Must be down to superstition huh? You may have heard of abuse of argument, Mark Lynas also uses it to 'prove' his points. To me it spells lacking much basis. You're right on one thing, no one will bother to read this ebook [I might give it a glance if it were free download] since Lynas is clearly not an environmentalist and never was, and his recent recanting has shown this clearly since he fails to grasp the core of environmentalism; the environment is more important than one species that thinks it's special, even godlike. When I see him defending GM on the basis of feeding the hungry, I know his critical faculties really aren't up to the subject matter and his gullibility shows. Much the same with nuclear, believe the spin and go with the money. Being one of the many Germans you don't know, what first comes to my mind is that we, the Germans, are currently looking for a possibiliy to dispose of our remaining nuclear waste. And guess what: Even the people in those locations where they have always been in favour of nuclear reactors, because the whole village was earning good money there, nobody will accept even an intermediate storage of waste from other nuclear plants in their vicinity. And the christian democrats in Southern Germany, who were always in favour of nuclear as long as the waste was to be brought to Gorleben, start crying out loud if Bavaria is discussed as an ultimate storage. Considering also that we would need not only conventional reactors but breeders, entering into a Plutonium economy, to really make a difference, and considering the cost of nuclear power (including research, insurance and disposal! ), I feel the nuclear option is just a dead end. Arguably Nuclear 1.0 has proven to be a dead end because of all the political problems it has run into. But Nuclear 2.0 seeks to resolve many (all?) of these with technology. Waste shouldn't have to be stored underground, or anywhere else, it should be used as fuel in breeder reactors. Yes, it makes for a "plutonium economy" for sure: so what? That has to be better and safer than a carbon economy. There is a section in Mark's book on the Energiewende and we energy wonks are watching Germany's progress with a mixture of awe and suspicion. If anybody can make it work it will be the Germans, but I remain unconvinced that it will manage to replace the carbon economy at least as as effectively as Nuclear 2.0. But I'm not hung up about it. "The risks are overstated" I agree with that. However, the Economist (not exactly a leftish/greenish publication) concluded in a special report last year that nuclear power is unlikely to have much of a future, simply due to its cost which has always been underestimated and shows no signs of coming down. You don't understand the practical difference between a Eu 6 trillion liability with a low risk in any one year - but non-zero; e.g., it would have happened in the UK after any repeat of the 1607 freak weather event or the 1703 great storm - and a Eu.100k or 1M liability with a risk of say one in 1,000 in any one year. If you would look behind the public utterances of TEPCO, they simply make the former Soviet Union after Chernobyl look a model of openness. The consequences of Fukushima are considerably worse than acknowledged and deaths are already occurring. But - the nuclear industry loves this - the development of thyroid or other cancer can be blamed on something else in the environment and no-one can prove it either way. The deaths from Fukushima would have been more visible if the wind had been in a different direction and the weather had been wet. You don't understand the implications of the lack of a proven waste disposal system. 37 years ago, Sir Brian Flowers who was then a Board Member of the AEA, called for one before any committment to a major nuclear power programme. You don't deal with the serious lack of high-grade uranium ore to fuel any significant nuclear resurgence, especially one that provides a significant percent of UK energy (see penultimate para.) The low energy return on energy invested, compared to fossil fuels, is serious or even fatal to any attempt to expand this technology sufficiently to fuel industrial society. Most people have a distorted idea of how much energy fission provides. In the UK, the 16% of electricity which is nuclear in origin amounts to 35 of delivered energy? The other 97%? Mostly natural gas, oil and coal. If you say nuclear almost the only option, how does the UK achieve and afford a 33-fold expansion in the nuclear capacity? This just strikes me as more special pleading for a dying industry to be given one last chance, along with the clamour for this from the amazingly powerful nuclear lobby. It had one last chance at Sizewell B, which cost £4 bn. Hinkley if built is £14 bn. The "new improved" EPR reactors in France and in Finland are vastly over time and over budget. Lots of good points, but then I suspect you haven't read this short ebook because most (possibly all) of them are answered. The one comment I would pick you up on is your critique of the "amazingly powerful nuclear lobby." My view is the complete opposite. I reckon the nuclear lobby is woeful and inept, which is one of the main reasons the industry is in retreat in Europe. In the battle for the hearts and minds of European consumers, it trails the renewables lobby by a huge margin. Why else would the Germans dismantle already paid for, operational nukes and start building new coal plants? So Mark, your key belief is that Nuclear 2.0 will no longer produce lethal waste that has to be stored absolutely faultlessly for 1000s of years? If that staggeringly bad bet still applied, then you'd instantly rule out Nuclear 2.0? I'm not sure its my "key belief" because I don't see the storage of relatively low level nuclear waste for thousands of years as a huge problem. The earth's crust is already a storehouse of low level radioactive material (think thorium and uranium) and we've survived quite nicely thank you. And bear in mind that the longer lasting a radioactive material is, the less radioactive it is (by definition). But the new nuclear technologies all seek to burn all the energy in the fuel and not just the 3% that the current fleet does, which is what gives rise to the piles of nuclear waste in the first place. Nuclear 1.0 was all based around a design to power nuclear submarines and was never the ideal implementation for civilian nuclear power. Nuclear 2.0 has the potential to power the earth for a century or more on just burning up the current stash of waste plus the decommissioned bomb material. We shouldn't be producing nuclear waste at all! It's inelegant, and I hate inelegance. Why do you think it's a "staggeringly bad bet?" Create no waste - and to consume all the old waste as well? - news to me, and to others apparently well informed - will come back to you on that! But 'Seek to' you say - so is it just a hope or aspiration, as likely as CCS, but pushing ahead regardless? Anyway you say it's only 'low level' - so these nuclear waste tombs (if any) are as harmless to wander around in as a uranium mine, give or take an order of magnitude? Convince me of all that, and maybe it's not such a 'staggeringly bad bet', tempting to deranged war lords or simple neglect of maintenance, over totally unpredictable 'thousands of years'. I like the poster of a Roman soldier with sword drawn, standing in front of Hinkley Point - 'If the Romans had nuclear power we'd be guarding their waste still'. You don't have to dig very deep to find out about fast breeder reactors. They are nothing new and, yes, they do promise to consume 99% of radioactive material and the resulting 1% waste lasts decades rather than millennia. There have been numerous fast breeder reactors but there have also been significant problems with them and as far as I know none has run commercially, so it's not a technology without its issues. But then the most promising R&D programme in the States was cut by Clinton and Gore and nuclear R&D has been pretty much in limbo ever since. You could do worse than read Mark's ebook! It's a good primer on the issues. OK, this is future hope, Nuclear 3.0. So its promise cannot support any present-technology nuclear programme - I mean Hinkley C isn't going to be Fast Breeder is it? Renewed worldwide Nuclear 2.0 is as "staggeringly bad bet" dirty as ever. Let's not think it's OK because Fast Breeders will (definitely maybe) come along to clean up Hinkley's renewed lethal output, as well as solving peak-uranium in the nick of time. Except that Hinckley Point C is an example of Nuclear 1.0, so I think we are getting our numbers in a muddle here. In reality, nuclear research doesn't split the technologies into 1.0 and 2.0, that is author's licence. More conventionally its talked about in "generations" and it's Gen 3 and Gen 4 that are attracting the interest. Fast breeders are but one possible technology here. Rather than me spelling out rather clumsily what the case is for nuclear power, why not read Mark's ebook? But I still think it's just what big biz wants, voices coming round to endorsing nuclear because of future hopes that one day Nuclear 2.0 may solve the lethal waste problem, not to mention the peak-uranium problem. The effect is to lend support to the present new wave of Nuclear 1.0 (or at best Nuclear 1.2) projects worldwide.